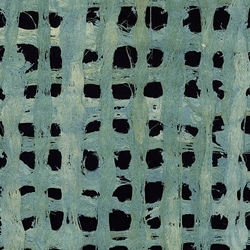 Amate Bark Paper from Mexico - Colors - Handmade by the Otomi Indian artisans of Mexico, the culture of amate paper dates back to pre-Columbian Meso-American times. The word amate derives from amatl, the Nahuatl word for paper. Mayan and Aztec Indians painted on amate paper to create codices (accordion folded books) depicting stories, historical events and even astrology. The Otomi people still use amate paper today for creating cutout figures for religious ceremonies while other village artisans use it for Mexican folk art depicting colorful urban scenes, festivals and celebrations. The paper is created from the bark of the amate wild fig tree (xalama), the nettle tree (jonote), and mulberry (moral). Each type of bark produces a different tone of color, ranging from coffee browns to silvery whites. The pulp from these barks are often combined to produce a swirling marble effect. The artisans first wash the bark, then boil it in a solution of lime juice for several hours, and lay strips on a wooden board. They beat the strips until they fuse together to form the desired texture, then dry them in the sun. This acid free paper is a wonderful choice for use in fine art including painting, ink and pastel drawings, crafts, invitations, cards, decoration and bookbinding. The solid, non-woven sheets are laser and inkjet printable.